« I’ll Take Some Robitussin with a side of Rabies Vaccine, please. Since I’ve got nothing, here’s some randomness from my life. I’ve recently been entertained by taking pictures of my food. I have no idea why. 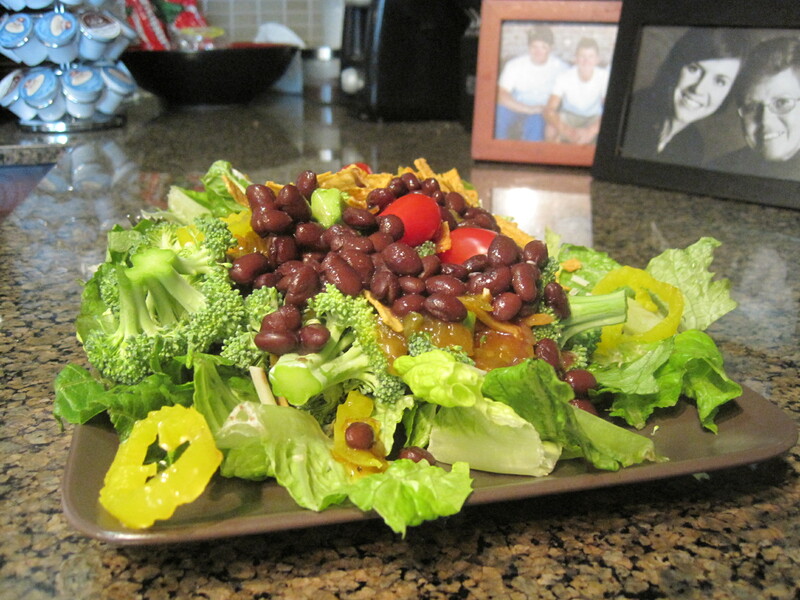 Don’t worry, this won’t turn into a here’s-everything-I-ate-today blog…I eat way too much crap to own up to that. 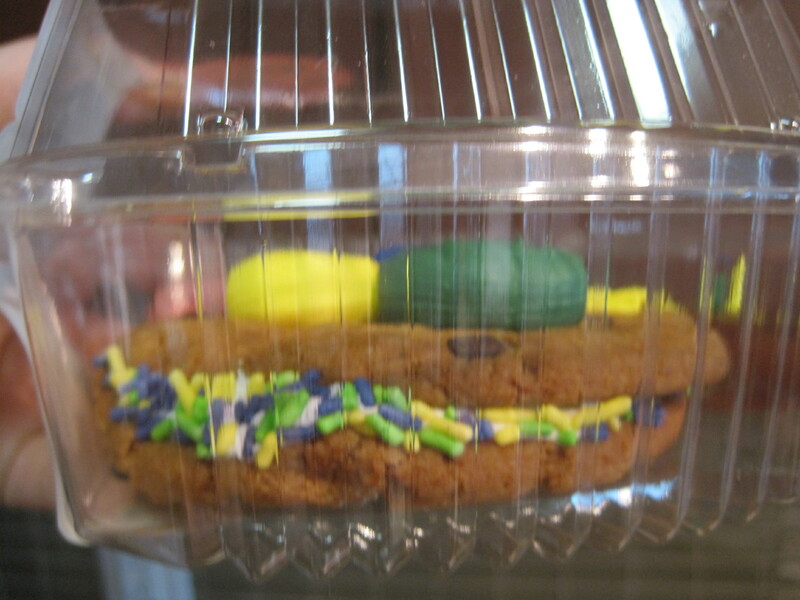 This is a cookie sandwich. Filled and topped with copious amounts of frosting. I bought it at Kroger when I was grocery shopping yesterday because the darn thing just jumped in my cart and I was powerless to stop it. If you’re concerned for neglected cookies everywhere, don’t worry, I ate part of it (read: three-fourths) later. 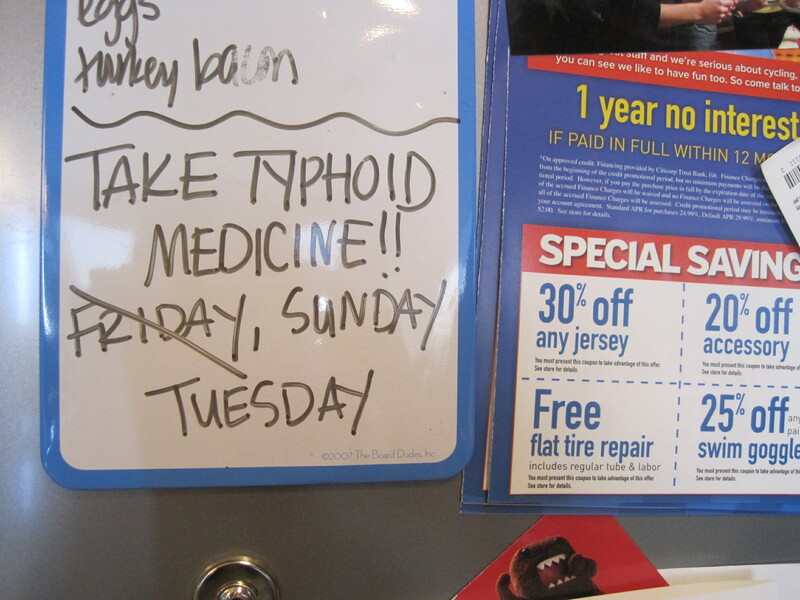 Do you have awesome reminders on your refrigerator to take your Typhoid Fever vaccination? First thing in the morning, with absolutely no food. Just one glass of water. Don’t mess it up. My lunch date. 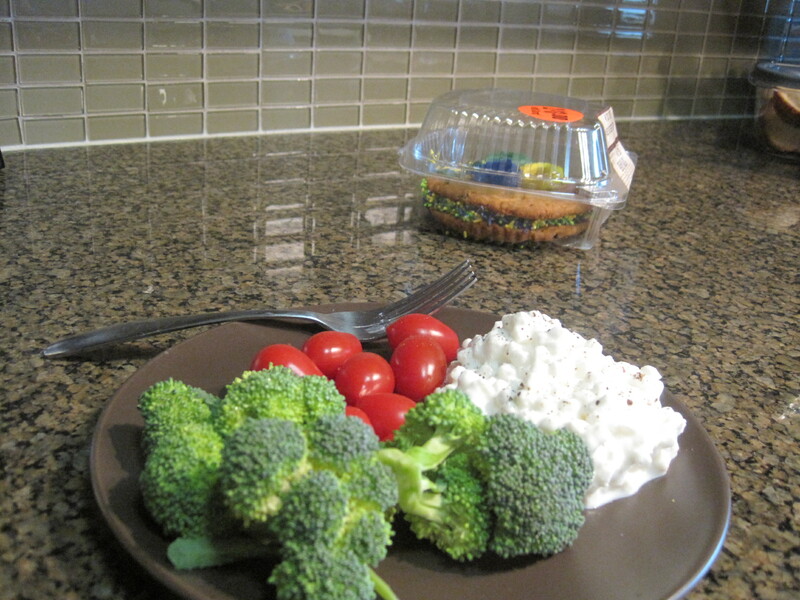 I’ve been having crazy cravings for broccoli lately (as evidenced by the entire head of it I put on my salad today.) 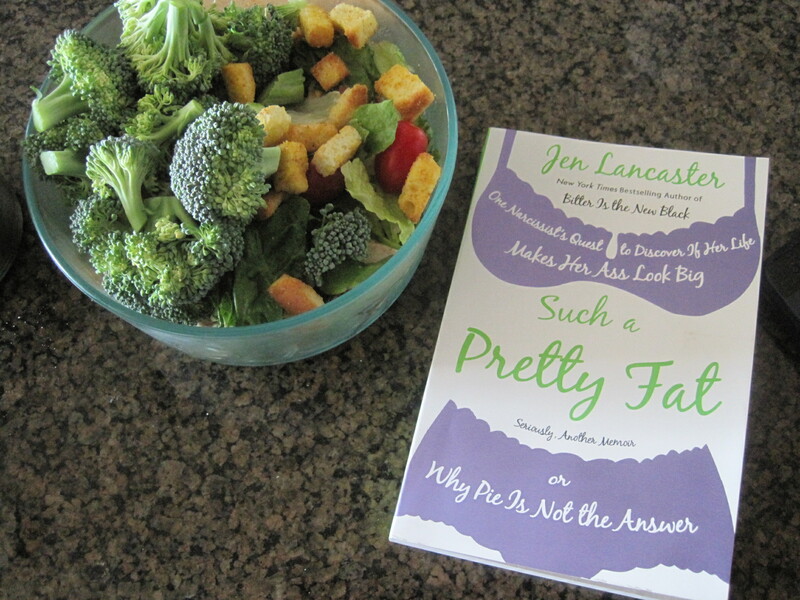 This book is the only one of Jen Lancaster’s that you can’t get in Nook format, and I’m too impatient to wait for the publisher to get their crap together and make it available that way. 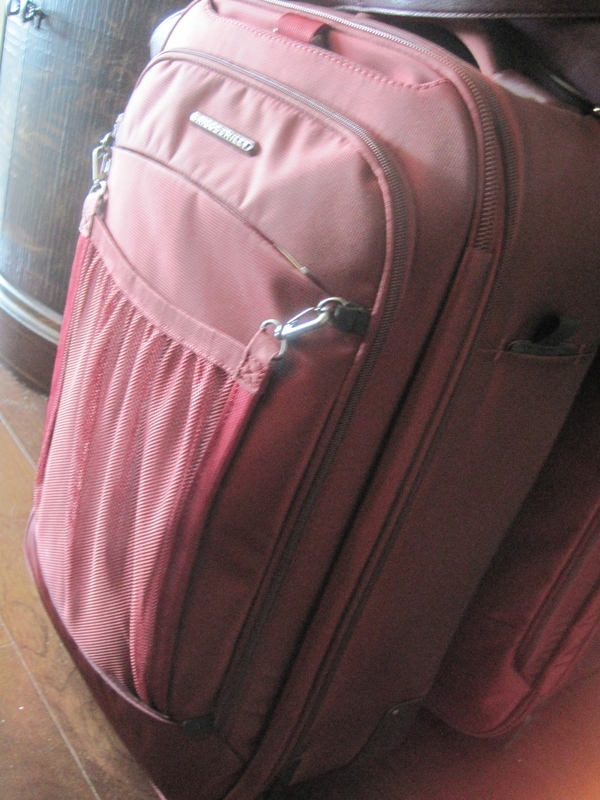 New pretty suitcase! Mine sadly died a horrible death on the trip to Australia so replacement was in order before the next overseas excursion. Mr. Engineer swears by Briggs & Riley (not cheap but they guarantee/repair them for life even if it’s the airline’s fault that it was damaged) and we found an outlet with a 15% off discount. Sold. 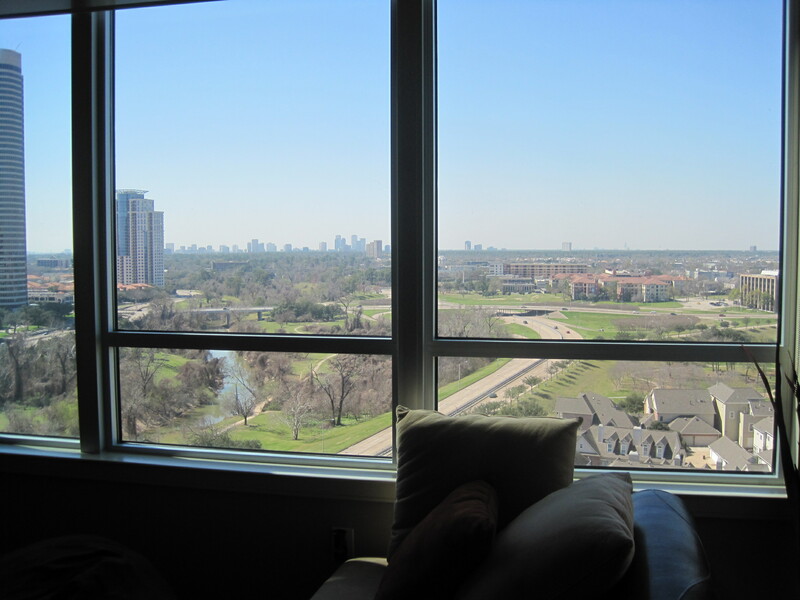 Apartment living room view on this gorgeous Texas day. Have I mentioned I will dearly miss this lovely little 800 square feet that I call home? Because I will. What’s the most you’d pay for this dress? (It’s from Anthropologie, not Target, sadly, so please align your expectations accordingly.) When I find something I really like I decide the most I’ll pay for it before I let myself look at the tag. This was over my threshold so it stayed at the store, but I just might be stalking the joint to see if it goes on sale. Oh, and uh, this is a running blog, right? Well I’ve just been spinning this week so far (recovery + getting over the Ninja Death Star Cold) but these gorgeous temps have me pretty excited to get back out there tomorrow. Hm… That’s a super cute dress but I’m pretty frugal when it comes to clothes. $45 at most. 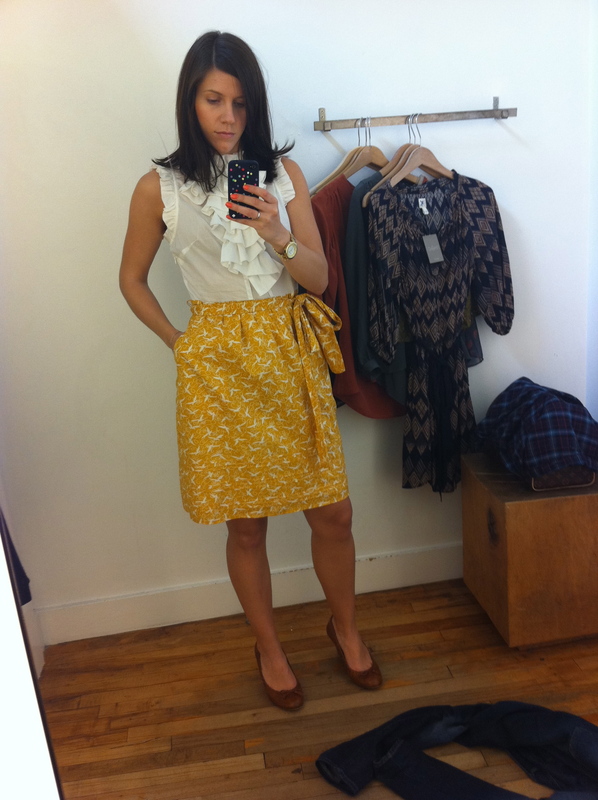 And I would have to try it on on two different store visits to make sure I still liked it. And when do we outsiders/blog readers get to find out about WHY the heck you’re going to PNG? Love the dress but can guarentee the price tag divided by number of times worn will still be too high. BUT if you cave and then decide you’re over it in a couple of years, I’d be ok if it found it’s way in to my closet. so much so that apparently blogging has thrice g’s. What what!?!?! hmmm…anthro…i’d guess well over $100, but my “won’t pay more” number is, hmmmmm…$85? i’m not helping. also, i want that cookie. WANT. A) Don’t you just hate it how those damn cookies walk themselves into our carts? I swear…. B) Your big windows and view = hello awesomeness! C) Cute Anthro dress! But that place is so damn expensive. I’m a super frugal shopper, so I’d say $65 max. But it IS super cute! That dress is adorable. I know Anthros dresses are way spendy, but I wouldn’t spend more than $100 on it. Hopefully, it goes on sale for you!! You are extremely gorgeous and I am obsessed with your outfits!!! Broccoli and cookie sandwiches….you are my kind of girl!!! These are truly lovely. I too have found myelsf an accidental collector at times. You start off finding one thing, then before you know it another and another. Funny I just saw one of these lovely hearts a few days ago and thought it was so pretty. i did not buy it instead choosing a tin of buttons, which seem to be my new collection.